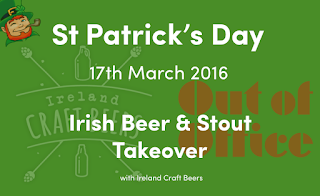 Out of Office, the new hot-desking space and bar near to Clapham Junction, is hosting a special Irish Craft Beer tasting session for St Patrick's Day, Thursday 17th March 2016. One of the people behind Out of Office is Charlie Pountney, who has been popping up with beer events for the past few years - I went to a similar event he ran 2 years ago, and it was excellent, so I have no hesitation in recommending this. Just make sure you don't have an incredibly busy Friday! "We're turning our pub Irish for one night only! 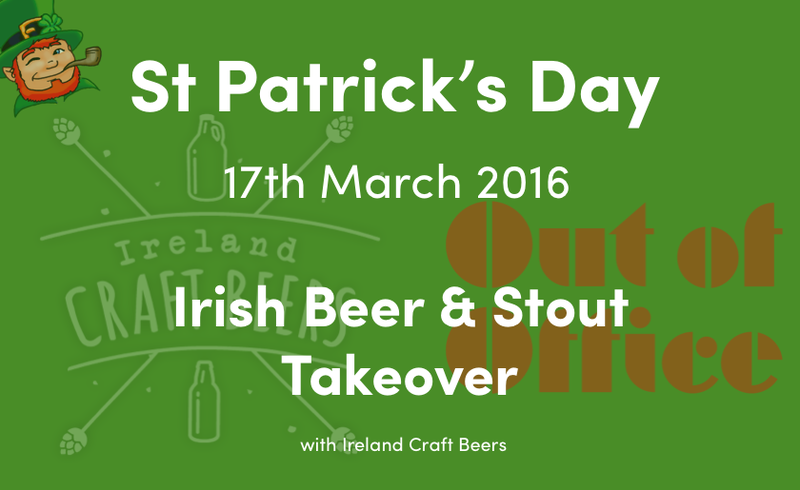 St Patrick's Day at Out Of Office is going to be one big celebration of Irish Craft Beer and the black stuff. A certain Mr Guinness has made the Emerald Isle famed for stouts but there is a whole lot more to Irish Brewing than what comes out of St James' Gate Bar. We've teamed up with Ireland Craft Beers to bring in some of the finest examples of Irish beer we can get our hands on. We're also supplementing the beer with all sorts of lovely stouts from around the globe. The team from Out Of Office will be coaching attendees through all they need to know about stouts and why we'd not even dream of stocking Guinness. We might even get a guest appearance from an irish leprechaun or two. Did I say leprechaun? I meant brewer." My weekly newsletter to features lots of news about all of the latest and best pop-up and temporary things in London. Please sign up below!